To estimate the amount of glucose in the whole of the given solution. Glucose is a very important monosaccharide in biology. It is one of the major products of photosynthesis. The living cell uses it as a source of energy and metabolic intermediate. The name "Gluc" comes from the Greek word "glykys", which means "sweet", plus the suffix "-ose" which denotes a sugar. Two stereoisomers of the aldohexose sugars are known as glucose, only one of which (D-glucose) is biologically active. This form (D-glucose) is often referred to as dextrose monohydrate, or, especially in the food industry, simply dextrose (from dextrorotatory glucose). For the structure of carbohydrates the bonding pattern of the hydrogen and hydroxyl groups around each carbon atom is very important. An asymmetric carbon atom is that a carbon atom which is bonded to four different groups. Glucose, with six carbon atoms, has four asymmetric carbon atoms. The arrangement of the OH's and H's on these atoms is very important. Structural formulas for sugar molecules are often written in the vertical arrangement with the aldehyde or the ketone group at or near the top. When written in this particular way, the position of the OH on the last asymmetric carbon atom will tell us whether we are dealing with a "D" sugar or an "L" sugar. "D" stands for dextro and "L" stands for levo. If the OH is on the right, it is a "D" sugar, in this case D-glucose. If the OH is on the left, then it has been "L" sugars. When you see D's and L's in front of the names of carbohydrates, this is the reason for it. Hermann Emil Fischer in 1891 devised the Fischer projection. It is a two-dimensional representation of a three-dimensional organic molecule by projection. Fischer projections were originally proposed for the depiction of carbohydrates and used by chemists, particularly in organic chemistry and biochemistry. 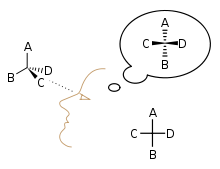 The use of Fischer projections in non-carbohydrates is discouraged; as such drawings are ambiguous when confused with other types of drawing. In Fischer projection all bonds are depicted as horizontal or vertical lines and these entire horizontal bonds project toward the viewer, while vertical bonds project away from the viewer. Therefore, a Fischer projection cannot be rotated by 90° or 270° in the plane of the page or the screen, as the orientation of bonds relative to one another can change, converting a molecule to its enantiomer. The carbon chain is depicted vertically, with carbon atoms represented by the centre of crossing lines. The orientation of the carbon chain is so that the C1 carbon is at the top. In an aldose, the carbon of the aldehyde group is C1; and in a ketose the carbon of the ketone group has the lowest possible number (usually C2). According to IUPAC rules all hydrogen atoms should preferably be drawn explicitly. Especially the hydrogen atoms of the end group of carbohydrates should be present. A Haworth projection is a common way of representing the cyclic structure of monosaccharide with a simple three-dimensional perspective. The Haworth projection was named after the English Chemist Sir Walter N. Haworth. • Carbon is the implicit type of atom. In the example Fig (a), the atoms numbered from 1 to 6 are all carbon atoms. Carbon 1 is known as the Anomeric Carbon. • Hydrogen atoms on carbon are implicit. In the example, atoms 1 to 6 have extra hydrogen atoms not depicted. • A thicker line indicates atoms that are closer to the observer. In the example Fig (a), atoms 2 and 3 (and their corresponding OH groups) are the closest to the observer, atoms 1 and 4 are farther from the observer and finally the remaining atoms (5, etc.) are the farthest. Fehling's solution is a chemical test used to differentiate between water-soluble aldehyde and ketone functional groups, and as a test for monosaccharides. The test was developed by German Chemist Hermann von Fehling in 1849. Fehling's solution is always prepared fresh in the laboratory. It is made initially as two separate solutions, known as Fehling's A and Fehling's B. Fehling's A is a blue aqueous solution of copper (II) sulphate pentahydrate crystals, while Fehling's B is a clear solution of aqueous potassium sodium tartrate (also known as Rochelle salt) and a strong alkali (commonly sodium hydroxide). Equal volumes of the two mixtures are mixed together to get the final Fehling's solution, which is a deep blue colour. 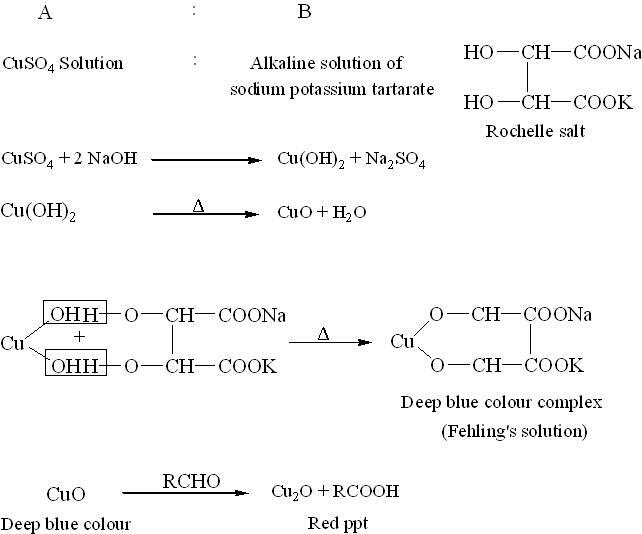 In this final mixture, aqueous tartrate ions from the dissolved Rochelle salt chelate to Cu2+ (aq) ions from the dissolved copper sulphate crystals, as bidentate ligands giving the bistartratocuprate(II) complex as shown below. Fehling's solution can be used to determine whether a carbonyl-containing compound is an aldehyde or a ketone. The bistartratocuprate (II) complex in Fehling's solution is an oxidizing agent and the active reagent in the test. The compound to be tested is added to the Fehling's solution and the mixture is heated. Aldehydes are oxidized, giving a positive result, but ketones do not react, unless they are alpha-hydroxy-ketones. The bistartratocuprate (II) complex oxidizes the aldehyde to a carboxylate anion, and in this process the copper (II) ions of the complex are reduced to copper (I) ions. Red copper (I) oxide then precipitates out of the reaction mixture, which indicates a positive result. That is redox reaction takes place. A negative result is the absence of the red precipitate; it is important to note that Fehling's will not work with aromatic aldehydes; in this case Tollens' reagent should be used. Fehling's test can be used as a generic test for monosaccharides. It will give a positive result for aldose monosaccharides (due to the oxidisable aldehyde group) but also for ketose monosaccharides, as they are converted to aldose by the base in the reagent, and then give a positive result. For this reason, Fehling's reagent is sometimes referred to as a general test for monosaccharides. Fehling's can be used to screen for glucose in urine, thus detecting diabetes. Another use is in conversion / breakdown of starch to glucose syrup and maltodextrins, to measure the amount of reducing sugars and calculating the dextrose equivalent (DE) of the starch sugar. Methylene blue is a heterocyclic aromatic chemical compound with the molecular formula C16H18N3SCl. It has many uses in different fields, such as biology and chemistry. At room temperature it appears as a dark green odourless solid powder, which yields a blue solution when dissolved in water. Methylene blue should not be confused with methyl blue, another histology stain, new methylene blue, or with the methyl violets often used as pH indicators. The International Nonproprietary Name (INN) of methylene blue is methylthioninium chloride. Methylene blue is widely used as redox indicator in analytical chemistry. In an oxidizing environment the solutions of this substance are blue, if exposed to a reducing agent it will turn colourless. The redox properties can be seen in a classical demonstration of chemical kinetics in general chemistry, the "blue bottle" experiment. Typically, a solution is made of dextrose, methylene blue, and sodium hydroxide. Upon shaking the bottle, oxygen oxidizes methylene blue, and the solution turns blue. The dextrose will gradually reduce the methylene blue to its colourless, reduced form. Hence, when the dissolved oxygen is entirely consumed, the solution will turn colourless. A freshly prepared Fehling’s solution is first standardized by titration against a standard solution of pure glucose A.R. The standardized Fehling’s solution is then used to determine the amount of glucose in an unknown sample or solution by direct titration. The Fehling’s solution being a solution of cupric ions is blue in colour and at the end point changes to red colour precipitate of cuprous oxide. As the supernatant liquid is blue and the precipitate is red in colour, there may be some difficulty in determination of end point accurately. Hence sometimes a methylene-blue indicator is employed for accurate determination of the end point.